Our family loves cinnamon rolls. I always have a stock of store bought rolls in the fridge for quick weekend breakfasts when I don’t feel like making anything more challenging. Last week with Mother’s Day coming up, I thought it would be an easy breakfast for Greg to make. But with some extra time on Friday I thought it would be nice to actually make cinnamon rolls from scratch instead. 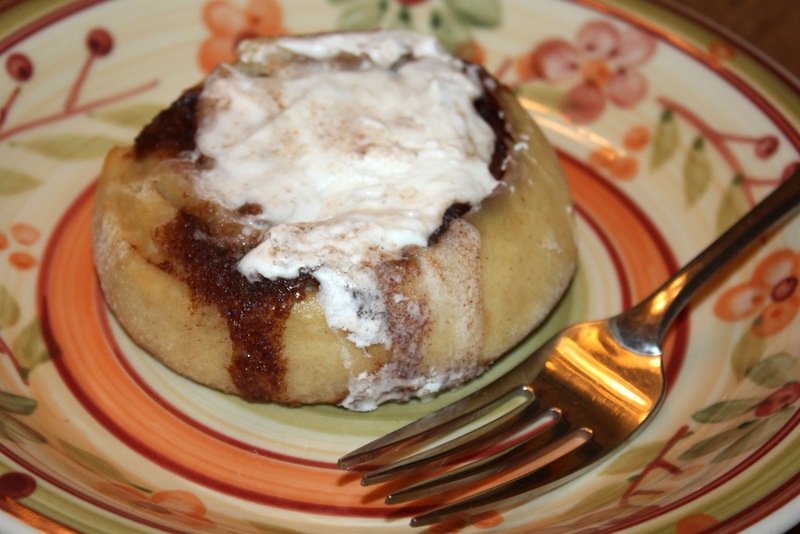 I always have mixed feelings about homemade cinnamon rolls. On one hand, they’re really really good. On the other hand, it’s nearly impossible to get them cooked properly. At least that seems to be my experience! 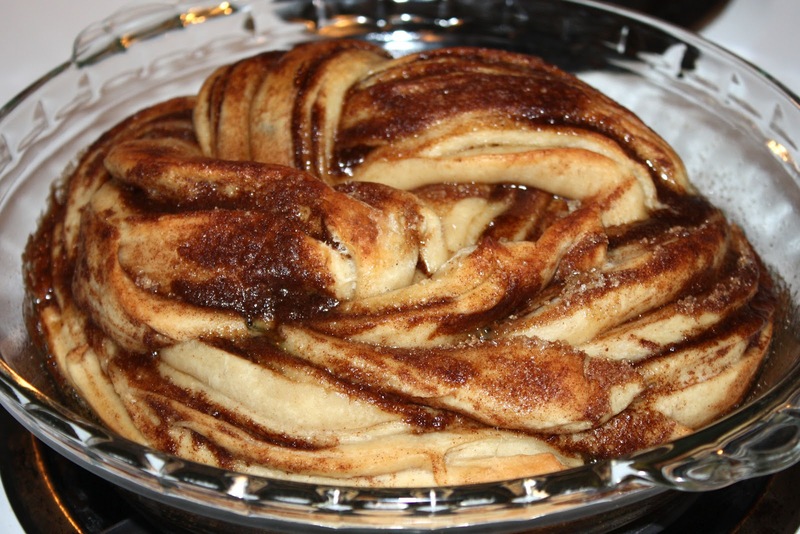 So I went searching for a different recipe and came across a blogger who felt the same way about doughy undercooked cinnamon rolls. And of course the duh moment – don’t squish them all together in a tight pan and they probably won’t be so doughy! To start the dough, mix 1 cup of warm milk, 1 tablespoon of sugar, and 2 1/2 teaspoons of yeast. Let sit for about ten minutes until bubbly. Mix in 2 eggs, 1/3 cup softened butter, 1/2 teaspoon of vanilla, 1/2 teaspoon of cinnamon, a pinch of nutmeg, 3 1/4 cups of flour, 3/4 cup of bread flour, 1 teaspoon of salt, and 1/2 cup of sugar. Knead for five minutes by hand or with your mixer. Put in an oiled, covered bowl and let rise for one hour. This is where I started having problems. My dough barely rose at all. I think I let it sit for close to three hours with almost no improvement. I finally decided to just go with it. I rolled it out and was impressed with how big I could make it. 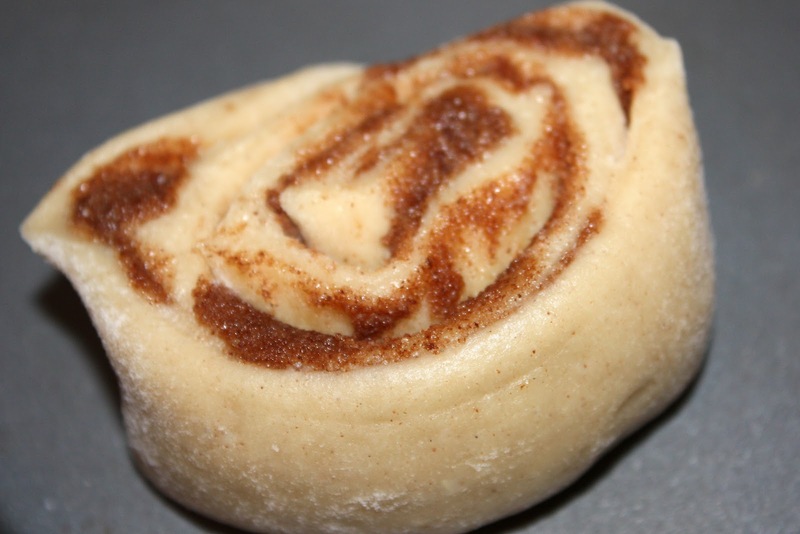 That’s another thing I get really annoyed with when making cinnamon rolls – the dough is so elastic that it’s nearly impossible to roll it out to a decent size. This dough was very pliable. 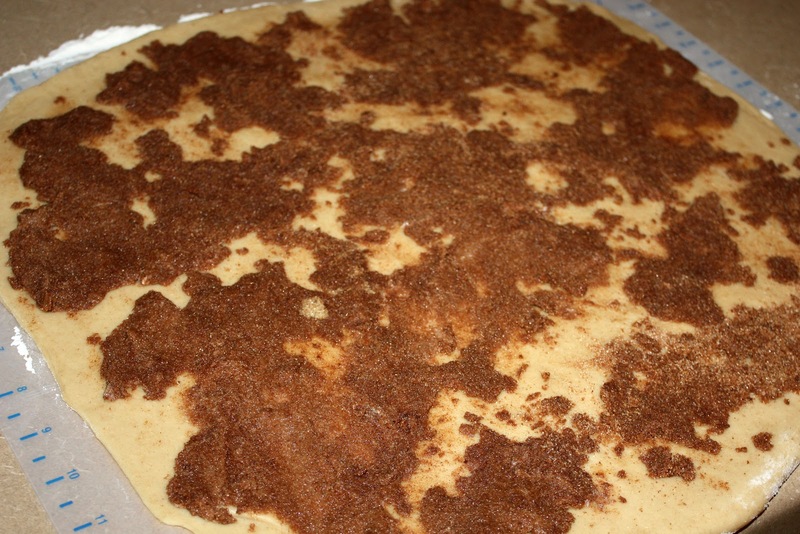 For the filling mix 1/2 cup of softened butter, 1/2 cup white sugar, 1/2 cup brown sugar, and 3 tablespoons of cinnamon. My butter wasn’t as soft as it should have been. It was really hard to evenly spread out the mixture. I eventually gave up on that too. Once it’s in the oven the filling will melt and spread out anyway. 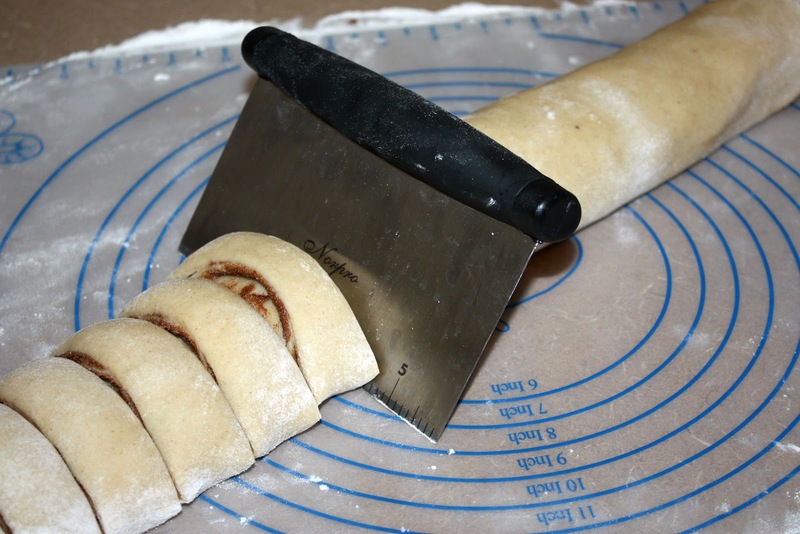 Roll up the dough as tightly as possible and slice into approximately one inch slices. 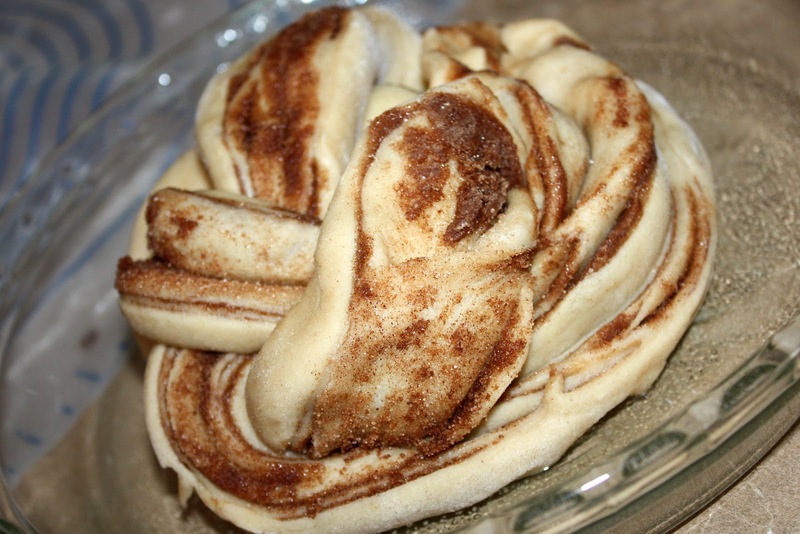 I decided to try something different and only used half of the dough to make regular cinnamon rolls. I’ll show you what I did with the other half in a minute. 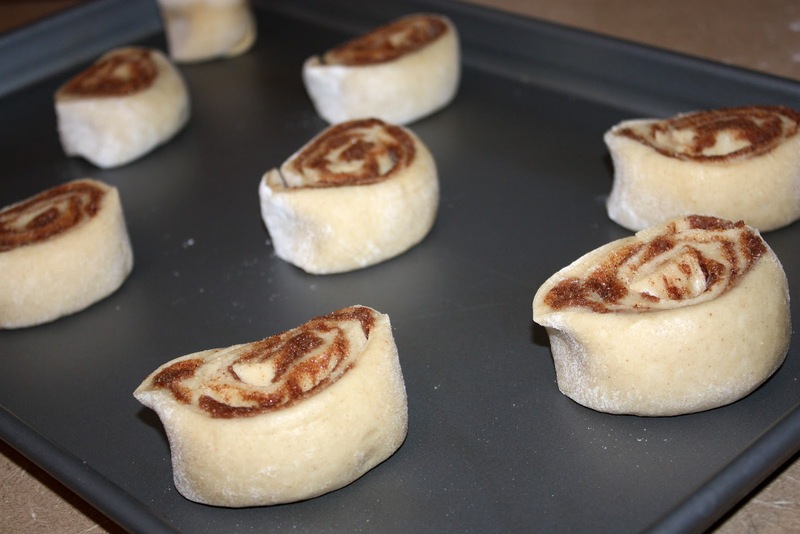 Lay rolls out on a pan, cover, and let rise for another hour. Mine did not at all after this. I’m not sure if I did something wrong or this dough is just more tempermental. Since I made these on Friday and Mother’s Day was Sunday, I put them in the freezer. Late Saturday night I moved them to the fridge and they were ready to be baked Sunday morning. Much smaller than I was expecting, but they’re kind of cute! When you’re ready, bake them at 400 degrees for about 10-12 minutes. With the other half of the dough I attempted to be creative by slicing the roll into three strips, horizontally. 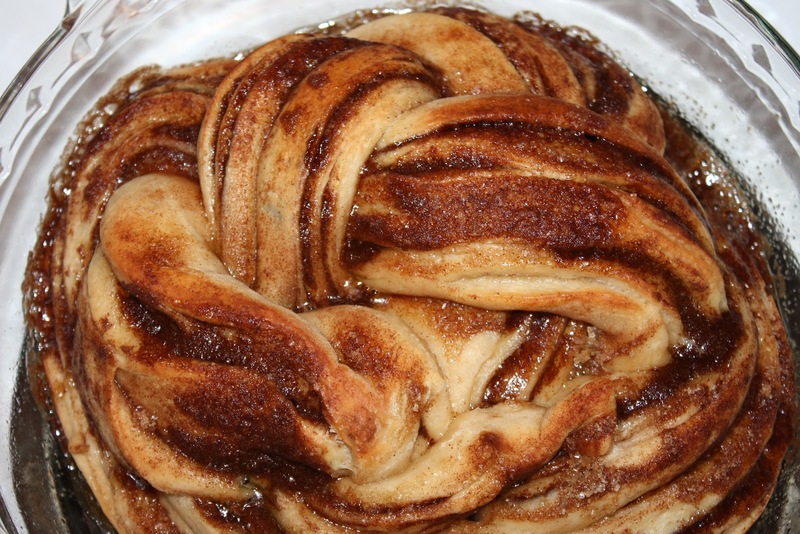 Then I braided them and rolled them together to make a giant cinnamon roll. We took the easy way out frosting these by using some leftover whipped vanilla frosting that was in the fridge. The original recipe includes a cream cheese frosting, but I knew Greg starts gagging when he sees the words cream cheese, so I decided not to even suggest he make it. The large cinnamon roll looked pretty, but was overall a huge fail. I don’t think there was any way to cook the entire thing through without totally burning the outside. The edges were good, but it was really a huge undercooked mess. The smaller rolls, though, were delicious! 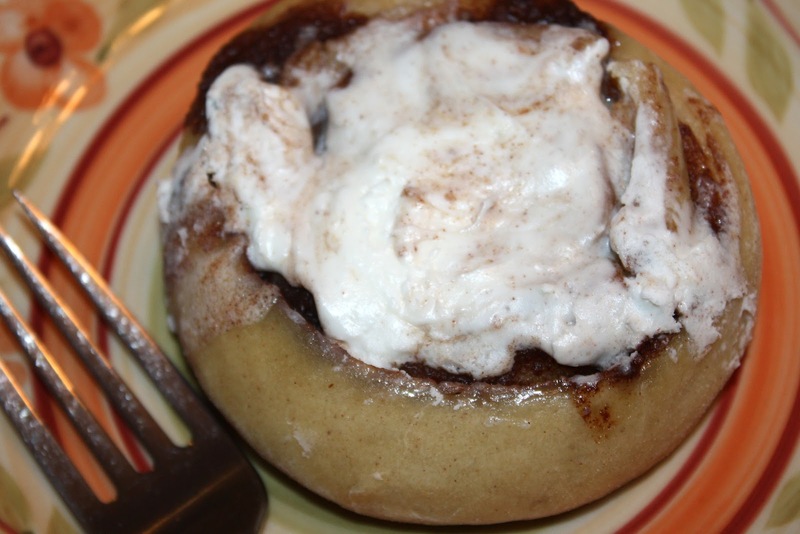 A little dense and the dough tasted a lot sweeter than regular cinnamon rolls. The additional spices in the dough made it unusual, but tasty. This is a recipe I’ll definitely be trying again – hopefully with slightly puffier results! 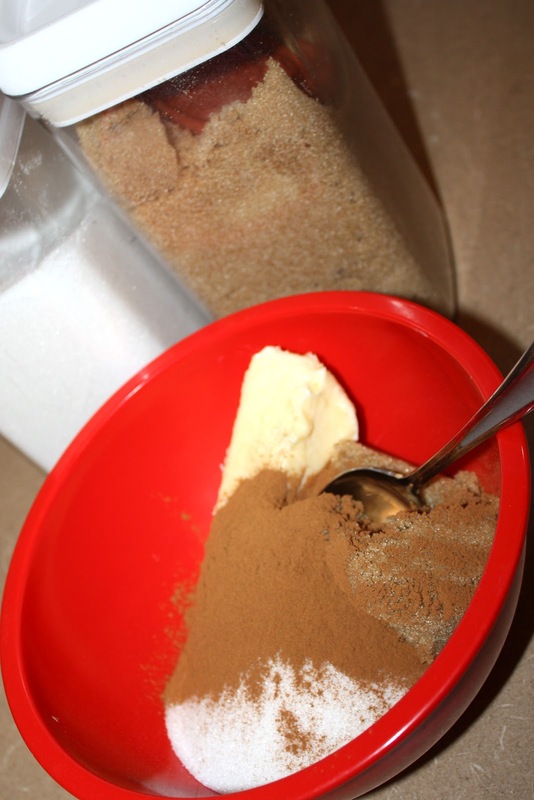 To start the dough, mix 1 cup of warm milk, 1 tablespoon of sugar, and 2 1/2 teaspoons of yeast. Let sit for about ten minutes until bubbly. Mix in 2 eggs, 1/3 cup softened butter, 1/2 teaspoon of vanilla, 1/2 teaspoon of cinnamon, a pinch of nutmeg, 3 1/4 cups of flour, 3/4 cup of bread flour, 1 teaspoon of salt, and 1/2 cup of sugar. Knead for five minutes by hand or with your mixer. Put in an oiled, covered bowl and let rise for one hour. 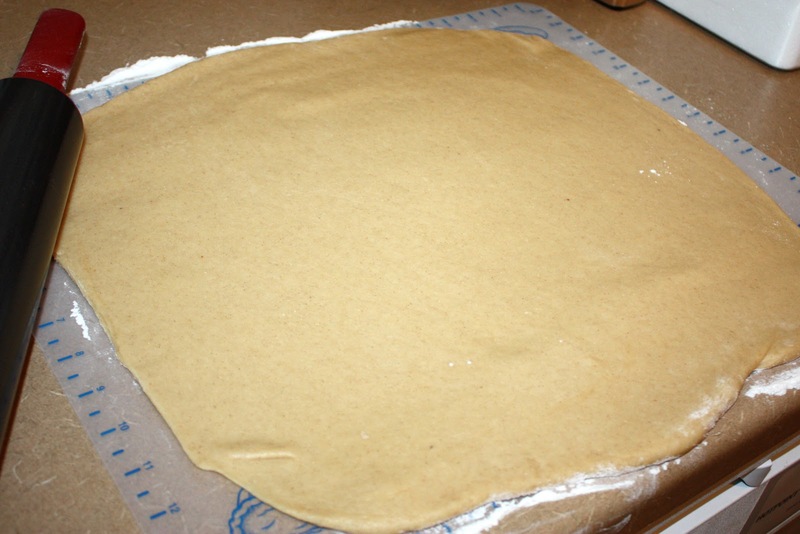 Roll dough into a rectangle. Make filling by mixing all ingredients. Spread filling over dough, roll tightly, and slice into 1 inch slices. Cover and let rise for one hour. Bake at 400 degrees for 10-12 minutes. Make cream cheese frosting by combining all ingredients. Spread over rolls and enjoy! Previous Previous post: Happy Mama’s Day!